In the small tub you will find a combination of crunchy California Sevillano olives, plum-purple, smoky Calamata and mildly tart Mammoth Black Greek olives, packed in brine. Something for everybody. 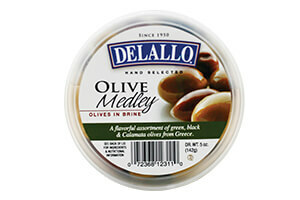 A colorful palate and harmony of textures and flavors in the Olive Medley. This mix is just absolutely wonderful as an appetizer. Contains pits. Ingredients:green olives, black Greek olives, calamata olives, water, salt, olive oil, lactic acid, citric acid, ascorbic acid, acetic acid.